If you’re single, you may want a psychic reading for insight on when you might meet somebody. Or, if you’ve already met somebody, you may want to know if he’s “the one.” You may want a psychic love reading because a relationship with somebody you’re in love with has ended, and you need to find out if or when you’ll get back together. Readings like these are types of love readings or relationship readings. 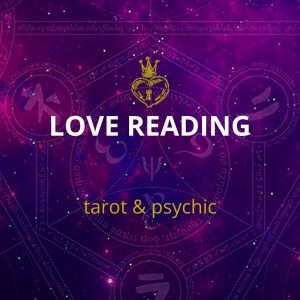 It’s important to perceive the big picture when it comes to getting a love reading from a psychic. And it’s important to know how to glean the best and most useful information from them. A competent psychic reader will tune in to your energy to pick up on what’s going on with you and with the people in your life. Psychics can give you valuable insights into the relationships among you. A psychic should also be able to give you an indication that they’ve made successful connections, but that’s really only the beginning. When psychics tune in to you or to somebody else, they pick up lots of information. They can sense how you and the other person feel at the moment. They can sense how what’s going on in your lives may impact the connections between you. and they can see further down your path, and get a sense of things that may happen in the future. But that future is always subject to free will. We are co-creators of our futures. Fate may dictate that we’ll have certain specific encounters or experiences, but ultimately, our destiny is not “set in stone” as the old saying goes. The decisions you make along with the actions you take can alter the outcome of future events. This concept applies to everyone. In other words, people can and do change their minds. We all can feel one way but act in another way. When it comes to love, you may feel passionately attracted to somebody, but then something happens that changes the way you feel about them. You may then conclude that they aren’t actually “the one” for you after all. So what’s the point of getting a psychic reading if everything you’re told will happen could possibly change? Besides tuning in to your energy and to the connections you have with somebody else, accurate psychic readers tune in to your beliefs and patterns that are driving the feelings you have and the actions you take. You may not even be aware of these beliefs and patterns. Good psychic readers will also have insights related to the intended soul lessons that the relationship you’re asking about is supposed to teach you. Our greatest lessons in life are taught by love. Often, when somebody appears in our lives, we convince ourselves that our destiny is to be together. But instead, they may have appeared so we can learn powerful big-picture lessons about love itself. When we feel fearful or anxious, it’s easy to persuade ourselves to believe that our security lies in certainty over knowing what will happen next. But our security actually comes from tapping into our own inner power in ways that allow us to attract the right relationship for us. This frees us from being controlled by what somebody else may or may not do. This freedom opens up our capability to attract and sustain a loving and healthy relationship. It can also draw our attention to the blocks we need to change, so we can attract the things we desire. Accurate psychic readers can answer the questions you ask. They can also help you gain a true understanding of what’s playing out in terms of your relationships, and what you can do to reclaim your power in them. Psychic love readings will focus on you. They will give you far greater insights into how you access your power to begin and maintain a loving relationship. Along with the other questions you want answered, ask big-picture questions as well, so you can gain deeper insights into yourself and the things you should do next, instead of obsessing over what might happen or not. The powerful spiritual insights you receive can break you out of waiting on somebody else’s next move. This allows the genuine potential of the situations you find yourself in to unfold and free you to attract the love that you genuinely deserve.